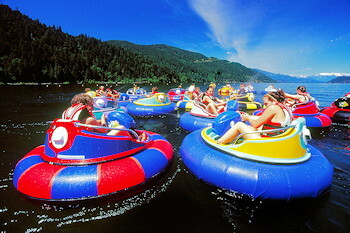 The friendly vacation town of Harrison Hot Springs, British Columbia, is located at the south end of Harrison Lake, a beautiful warm 60km (37mi) long lake ideal for boating, sailing and swimming. According to history, the hot springs were discovered in 1859 when paddlers capsized in winter and realized that the lake water was warm. 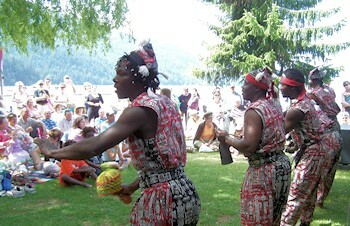 There are two hot springs on the shore of Harrison Lake making it a very popular resort and health spa with people from all corners of the globe. The Harrison Hot Springs area is also known as the home of the legendary Sasquatch, a very elusive, giant apelike creature. 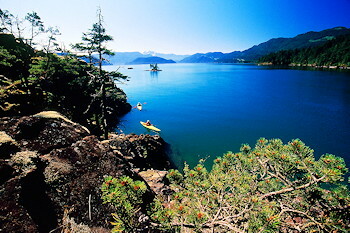 Harrison Hot Springs is an ideal holiday spot with hot springs, top quality accommodations, unique and interesting shops, restaurants and dining facilities, and a wide array of recreational outdoor adventures. Accommodations: World class hotels, motels, bed and breakfast, and RV Parks. Access: Approximately125km (78mi) east of Vancouver, British Columbia, on BC Highway 7 on the north side of the Fraser River and a short distance from the junction of BC Hwys 7 and 9. Highway 9 crosses the Fraser River and links up with Highway 1 (The Trans Canada Hwy). Recreation Facilities/Activities: swimming, sailing, windsurfing, fishing, boating, canoeing, golfing, hiking, or soaking in one of the mineral pools. 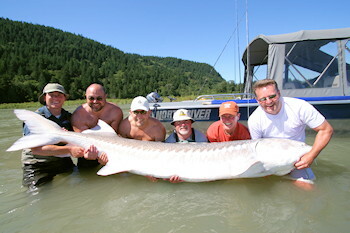 Local Attractions: Harrison Public Hot Pools, Harrison Lake, Festival of Arts and Sasquatch Provincial Park.